Reserve your webinar seat now... register here. Join Mary Fugier for a technical presentation on how to use Layouts in Rhino 5. Learn how to arrange views of both 2D and 3D models on the title block at different scales and prepare it for printing. Also see how to add annotations to the layout, like text, dimensions and plot to a PDF. Layer color/visibility per detail and Annotation Scaling will also be discussed. The presentation will be based on this tutorial. 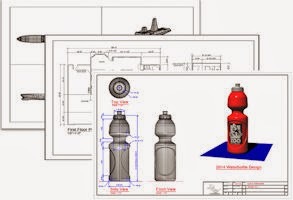 Example models used will include: 2D imperial architectural, 3D metric marine and 3D imperial product. Presentation will be approximately 90 minutes. Questions will be addressed at specific breaks in the presentation, as well as at the end. Can't make the live presentation? No problem! It will be recorded and posted here.